This week in the Do as the Locals Do series, I’d like to take you on a trip to the little island of Malta in the Mediterranean Sea. 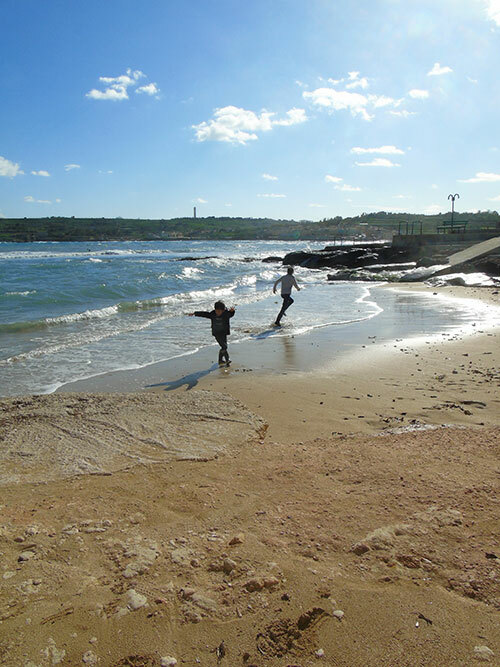 Desiree’ from The Anti Tourist was born and raised in Malta, and will provide us with an insights guide of her hometown, Marsaskala. Nestled between the ever popular fishing village of Marsaxlokk and the iconic Grand Harbour, Marsaskala might not be high on the must-see list when visiting Malta. Well, dear reader, I’m going to show you just how much of a mistake that is. 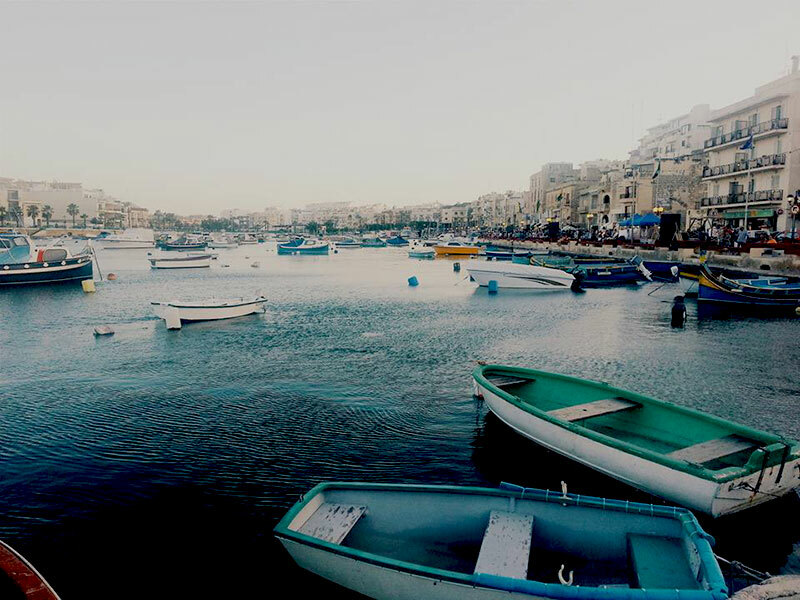 Marsaskala, or Wied il-Għajn, as it is known by us locals, has recently seen a massive boom of inhabitants and tourists alike over a short span of years. Why? Because this tiny seaside town has the best of both worlds: a young, forward-thinking population and an old-school, peaceful atmosphere. The best thing about a seaside town is, of course, its beaches! 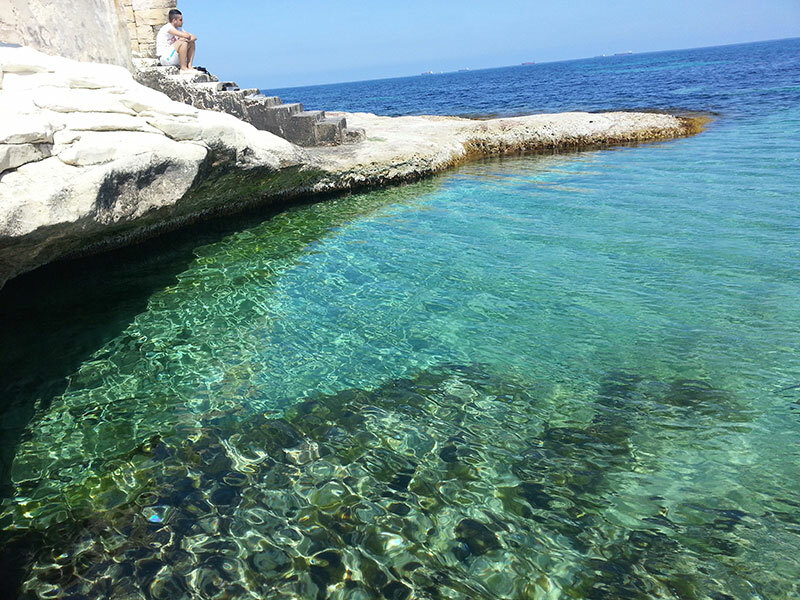 You can find most of us lapping up the sun’s rays from May to October (yes, that’s the summer season here in Malta), and enjoying the crystal clear sea in Marsaskala. The diversity of beaches is another plus; from the sandy, family-friendly St Thomas’ Bay, to the rocky beach at Zonqor Point, there is ample choice and all are equally gorgeous in their own right. Perhaps the greatest appeal of these beaches is that they aren’t as touristy or ‘polished’ as the more popular beaches up north – they’re still mostly in their natural state, which is just why we love them. Whichever beach you choose to spend your day at, don’t forget to try out the nation’s favourite seaside snack – a delicious ħobża biż-żejt – which is bread spread with tomato paste, tuna and herbs. Trust me, nothing makes sunny, beachy days tastier. 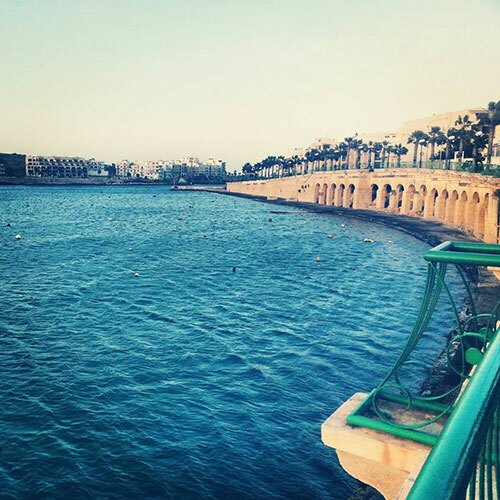 Marsaskala grew around its little harbour, and its kilometre-long promenade is the town’s centre. This is where families and friends meet for a chat by the sea, or a tasty take-away from the surrounding restaurants. 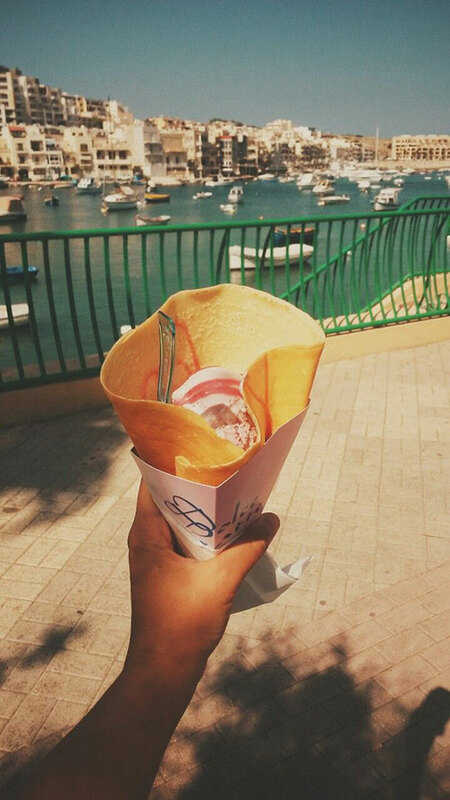 Local favourites are the Brighton take-away for that casual chippy, or the legendary Dolce Latte for mouth-watering crepes and ice creams. Inexpensive and delicious? Score. There’s nothing more relaxing than a stroll along the promenade, although beware: it gets quite crowded during the weekend! You might want to come over during the week for a taste of our serene hometown. As a Mediterranean country, Malta peaks during the summer months. Our beaches are full and there are tourists aplenty. But Marsaskala simply blooms in winter and spring, and in my opinion, it becomes even more beautiful. With the tourists gone, a sleepy calm falls over the town, allowing nature to take the limelight. 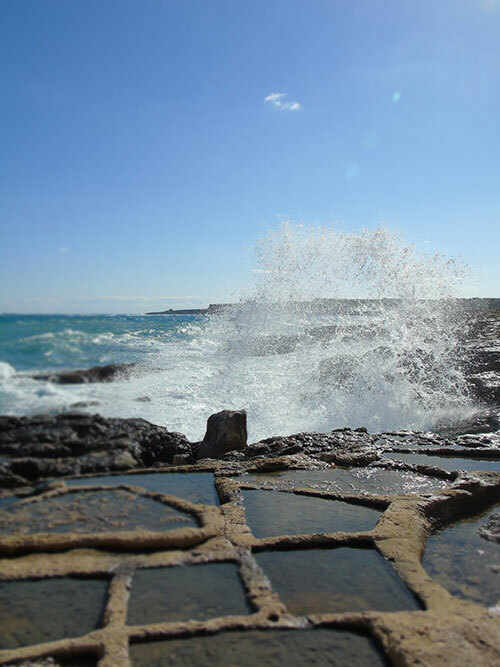 On windy days, there’s nowhere I’d rather be than snuggled in my car, watching the waves crash on the salt pans and rocks, or, if I’m feeling adventurous, walking along the coast and enjoying the salty sea spray! While our beaches are well known and loved, our countryside is something of a secret, even among nationals. In winter, the once dry fields become lush and green, and are a real pleasure to walk through. Check out the Żonqor area for picture perfect landscapes – trust me, you’re in for a treat. Here’s hoping I see you soon in Marsaskala! I already know you’ll be loving it. Would you like to be featured with an article on YOUR town in the Do as the Locals Do series? Then send me an email for more details. Desiree ’ is a law student and activist from Malta. When she doesn’t have her nose buried in a book, she’s either road tripping around her country or flying off to somewhere new. 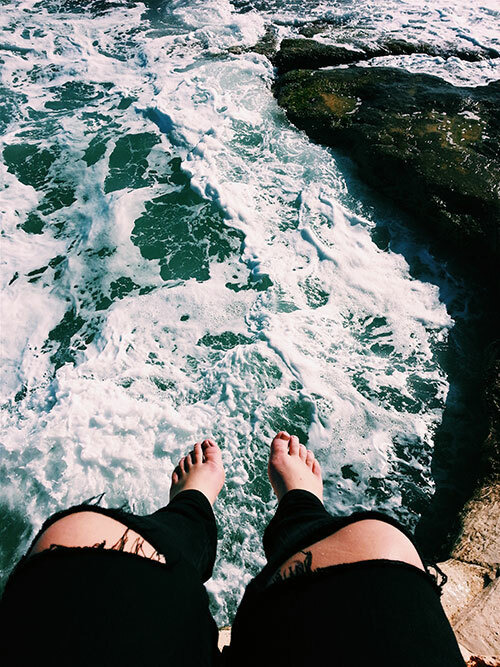 Her blog, The Anti-Tourist, promotes a genuine approach to travel, going beyond cliched photos and tacky souvenirs to discovering new cultures and lifestyles.